Garver, along with other local businesses, provided monetary assistance to plant more than 32,000 sea oats along the shoreline at Norriego Point in Destin, Florida. Norriego Point, the entry point to the Destin Harbor and entrance to the gulf, has faced erosion and destabilization issues since Hurricane Opal hit the area in 1995. Garver’s Destin, Florida office has also supported stabilization efforts by providing surveying and construction staking. 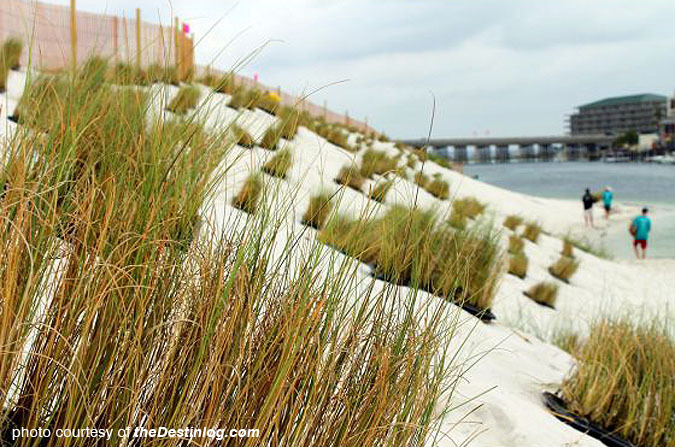 Sea oats live in salty environments and have a long root system that firmly holds loose soil, making them a natural choice for Norriego Point’s stabilization project. See The Destin Log for more information on the volunteer planting efforts. Garver’s services at Norriego Point recently included pre-dredged and post-dredged hydrographic surveys of the main channel. A heavy storm had moved a large amount of sand and nearly closed off the entrance to Destin Harbor. Garver determined the harbor’s topography and provided the city with sand removal quantities, which enabled a contractor to remove the material and open the channel.